Just one day after the new trailer debuted for The Hunger Games: Mockingjay Part 2, Lionsgate has debuted a stylish new IMAX poster, featuring Katniss Everdeen (Jennifer Lawrence) and the tagline "Nothing Can Prepare You For The End." Wired debuted this one-sheet, which features plenty of intriguing symbolism, such as the drops of blood shown on the white roses. 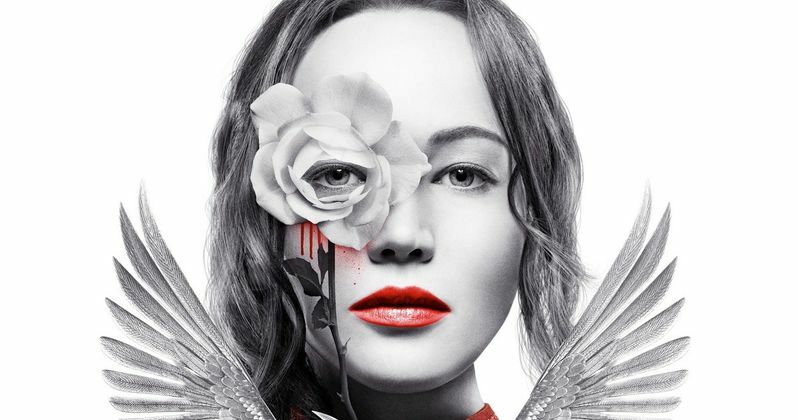 President Snow (Donald Sutherland) has always used white roses as a symbolic gesture, leaving them as veiled threats towards Katniss, but this poster also serves as an "in-world" piece of propaganda for Katniss and the growing rebellion. It's also intriguing that Katniss' eye, the same one she uses to aim her bow and arrow, is obscured by one of these white roses, but we can see blood running down her face, just below the rose. Below Katniss we see the iconic Mockingjay symbol, with a slew of Peacekeepers surrounding the wings, along with a few blood-splattered white roses. This one-sheet certainly hints at the showdown between Katniss' rebellion and Snow's soldiers in the Capitol, which will happen in just over a month when The Hunger Games: Mockingjay Part 2 hits theaters on November 20. The late Philip Seymour Hoffman, in his final role as Plutarch Heavensbee, leads the supporting cast, alongside Julianne Moore (Alma Coin), Natalie Dormer (Cressida), Stef Dawson (Annie Cresta), Evan Ross (Messalla), Patina Miller (Commmander Paylor), Robert Knepper (Antonius), Elizabeth Banks (Effie Trinket), Willow Shields (Primrose Everdeen) Woody Harrelson (Haymitch Abernathy), Jeffrey Wright (Beetee), Stanley Tucci (Caesar Flickerman), Mahershala Ali (Boggs), Wes Chatham (Castor) and Elden Henson (Pollux). The franchise finale will also feature a few new characters including Gwendoline Christie's Commander Lyme and Eugenie Bondurant as Tigris. The Hunger Games: Catching Fire and The Hunger Games: Mockingjay Part 1 director Francis Lawrence is returning to the helm, working from a script by Danny Strong (Lee Daniels' the Butler) and Peter Craig (The Town). In The Hunger Games: Mockingjay Part 1, fans learned that Snow used white roses to mask the fact that he smells like blood, thanks to years of poisoning his enemies. Will Snow get his comeuppance in The Hunger Games: Mockingjay Part 2? Let us know what you think, after checking out this stylish poster.